We are continuously looking for new rules that you can implement into your scripts to create a more dynamic result and today we are unveiling the new Forecast rule. Previously we only provided the current weather conditions but using the new forecast rule you can now select the weather forecast from today to 9 days in advance. 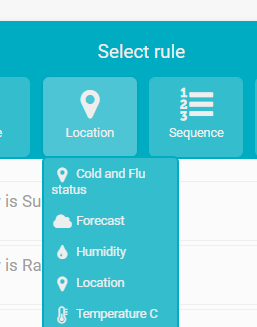 To use the forecast rule, select it from the Location rule group. To choose the forecast condition for up to 9 day from now, type today+ into the search box. A drop down list will prompt you to choose one of the options. For example, if today is Monday and you want to know if it is forecast to rain on Wednesday, you would add the condition Today+2 Rain. This rule also allows you to group together multiple weather conditions with multiple days as either a Match all or Match any. For example, if the creative only cared about tomorrow being a sunny day, you can have one line mentioning tomorrow being a sunny day and another line grouping together the non sunny values with a Match Any operator. If the weather forecast was anything but sunny then the second line would play. If you wanted to provide creative on the condition that this weekend is sunny you could implement the Day of week rule alongside the Forecast rule. 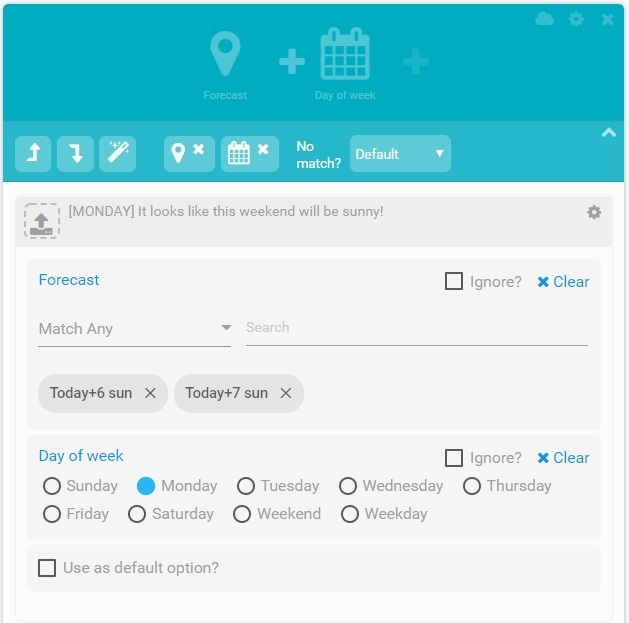 As you can see in the screenshot, the Day of week rule is set to Monday and the forecast is set to ‘Today+5 sun’ and ‘Today+6 sun’ to see if the forecast for either Saturday or Sunday is sunny. You could then go through the rest of the week: On Tuesday set the rule to ‘Today+4 Sun’ and ‘Today+5 Sun’ as the weekend is 4 and 5 days after Tuesday. The new weather forecast rule has plenty of creative potential. In this blog we suggest a range of ideas that use this forecast rule.